*Selected products. Ends April 30th. 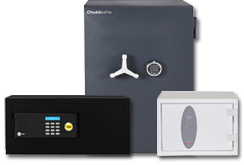 At Safe.co.uk our experts select the best security products and devices for your home or business. With smart locks and home alarm systems, CCTV cameras, gun cabinets, and safes from trusted brands, you'll find security for the whole home at Safe.co.uk. Whether you're buying a replacement front door lock for your home, or security for every aspect of your business, with our team of experts, and our lowest price guarantee, you're Safe with us.